A powerful and fast acting stain remover for instant action against dried on dirt and grime. For maximum speed and power pre treat or soak to see results in 30 seconds. Safe to use both on colours and whites. Our gold standard - powder fabric stain remover. 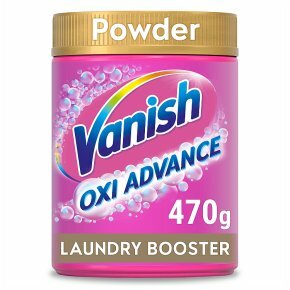 1st time Amazing Stain Removal even in a cold wash Millions of Oxi Action bubbles Powerful Oxi Action formula Safe on everyday fabrics*, colours and whites *everyday fabrics like cotton and polyester Nothing but the ingredients you need Free From Chlorine Bleach. Unbeatable Stain Fighters Sodium Percarbonate - Releases active oxygen to lift out stains safely. Enzymes - Break down food, starch and outdoor stains. Anionic Surfactants & Non-ionic Surfactants - Remove greasy stains safely. Cleaning Boosters & Helpers Sodium Carbonate - Enhances deep cleaning. Tetraacetylethylenediamine (TAED) - Boosts stain removal even at low temperatures. Zeolite - Softens water. Freshness Booster Perfume - Provides a boost of scent. Pre-Treat Clean & dry the scoop before placing back into tub After pre-treat wash as usual Mix 10g of powder with equal amount of water and stir for 30 secs Apply mix on the stain Rub the stain as needed Soak After soaking wash as usual or rinse thoroughly Add x1 scoop to 4L of water For Whites 6h Max For Colours 1h Max For best results on stains, rub before rinsing 1 scoop = 60ml Wash Add with your detergent in the drawer: For normal stains x 1/2 scoop For tough & dried-in stains x 1 scoop Just add one scoop in every wash Usage Advice: Always follow washing instructions on garment or fabric label. Check for colour fastness by testing a hidden area of the fabric. Rinse and allow to dry For best results, it may be necessary to repeat parts of the process. Do not use on any garment or rug made of wool, silk or leather. Do not use on finished or coated surfaces - for example wood, metals etc. Do not soak fabrics with metal fasteners or flame-resistant finishes. Do not expose pre-treated or soaked garments to sources of direct heat or direct sunlight before washing or rinsing thoroughly. Do not contaminate the product in the tub. Once mixed, do not leave solution in a sealed container. It will continue to give off oxygen and the container may build up pressure and may leak.